Mikołaj Trzaska 8, Oleś|Trzaska|Oleś|Cappozzo 1. Welcome to Suite for trio +. This is a unique and innovative CD where the circumstances of its creation and the history connected with it, including the fact that it has not been published for over two years, make for an interesting story. It all started when, together with Mikołaj Trzaska, we were looking for a musician who would enrich the sound of the Oleś | Trzaska | Oleś band. Our choice was the outstanding French trumpet player Jean-Luc Cappozzo, whom we heard for the first time while working with Louis Sclavis. It was impossible not to notice the crystal-clear sound of his trumpet and his unlimited talent coupled with technically brilliant phrasing skills which are full of surprising and witty turning points. Jean-Luc is a skilful and open minded musician who constantly challenged us both on and off stage! During the very first concert, we realised that the sound of Cappozzo’s trumpet and his presence in the band changed the character of our music more than we could have imagined! We decided we must make a recording with this amazing musician and we achieved our goal when the French artist visited Poland for the second time. This was the culminating point of both the concert tour and the existence of the band. The original studio recording was rife with technical errors, which was one of the reasons the material was not published earlier. During the intervening period between the first recording and this one we focused on the concerts of the Oleś | Trzaska | Oleś trio, the cooperation with Theo Jörgensmann and working on various solo projects. Simultaneously, recordings were made with David Murray, Andrzej Przybielski, Erik Friedlander and Ken Vandermark which resulted in the creation of new and exciting theatre music. Suite for trio + recorded with Jean-Luc Cappozzo possesses a haunting and charming quality that has matured like a good wine to become – with the passing of time – richer in taste and flavour. 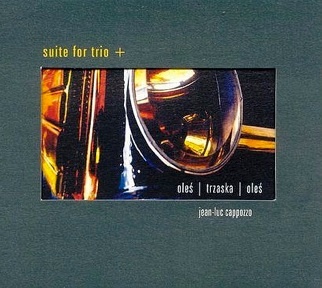 With the help of the invaluable Michał Rosicki we have managed to overcome the technical imperfections of the original and decided to have Suite for trio + published in the present form and, at the same time, document an important period in our development in which the cooperation with Jean-Luc Cappozzo was so crucial. Many times people come across a free jazz improvisation album and assume they know what it's going to sound like, but here is something that belies those preconceptions. Comprised of trumpet, alto saxophone or bass clarinet, acoustic bass, and drums, Suite for Trio + seamlessly fuses composed sections with free improvisation to yield a haunting, understated sound that utilizes space as much as the notes played. Opening with a short free improvisation supported by sounds resembling rocks in a water bowl, the music moves forward upon the emergence of an insistent bass clarinet hum from Mikolaj Traska, accompanied by Marcin Oles’ bass. Seconds later, Jean-Luc Cappozzo smears and burps with his trumpet ultimately smoothing out into a lyrical voice. Their use of space and economy of notes combined with song like lyricism sets the stage for the flow of the rest of the set. “N-Ju” is a little more freeform at times, but it follows suit with a stark opening where Marcin Oles’ gut strings sing as they come in contact with his bow, slowly opening into a duet with Capazzo. As his trumpet explores the open space of the song, Bartolmeiej Brat Oles introduces Trazska with a driving bass drum, creating a structured inside-out free-for-all sound bookended by a theme not too far from something you would hear John Zorn’s Masada quartet perform. Even the more straightahead or classical-influenced numbers like “Bolero Stefano” hold true to a dramatic sentiment. Here Marcin Oles anchors the group with a repeating undulating figure around which the rest of the group functions, and Traska contributes one of his strongest solos on the undervalued and underutilized bass clarinet, shading the composition in a myriad of ways. Capozzo joins in for the theme at the same midtempo pace and the two slowly rework the statement, elongating portions here and there, essentially repeating the same figures multiple times without invoking a repetitious feel. While everyone contributes uniquely to this cohesive group sound, the Oles brothers form the foundation and the heartbeat upon which Trazaska and Capozzo operate. Drummer Batrolemiej Brat Oles in particular is a powerhouse in this format. Like his astute and understated play in the brothers' trio set with David Murray Circles Live in Cracow or their free jam sessions with members of the Vandermark 5 on Alchemia, he performs with nuance and an almost folkish feel that is aligned with the hand percussion or modified kit work of Leon Parker, Hamid Drake, and Satishi Takeishi. Similarly, Marcin Oles plays with a captivating sense of confidence and vigor, never bottling up the improvisers nor backing every statement with stated or implied time. Like any other album that relies upon interactivity and improvisation, the key to Suite for Trio + is the musicians' ability to listen and interact in a concerted, effective manner. Neither relying on volume to make a statement or ever demanding the lead, all four players respond from moment to moment with a sense of drama and mystery amidst the dark-hued ambience the album provides. Better late than never. This album was released about two years ago, but I managed to get hold of it just now, so it can still get a review, and with reason. I have expressed my appreciation for the Polish twin brothers Marcin Oles (bass) and Bartlomiej Oles (drums) before, and with this album they climb even higher in my esteem. Their fellow countryman Mikolaj Trzaska plays sax to form their usual trio, and Frenchman Jean-Luc Cappozzo now also joins on trumpet. I had never heard of Cappozzo, and I'm glad I do now, because he is really excellent in this free musical environment, which is suprising for someone who apparently learned to play in the French army. This is the kind of free jazz that I like the most : free improvisation on a structured basis, creative, rhythmic, soft and intense. Listen to the title track : a unisono melody of sax and trumpet on a slow Eastern rhythm, out of which the trumpet frees itself for a beautiful solo, then the whole thing evolves into a bass solo by Marcin Oles, and believe me, this guy is among the best you can hear on the instrument these days, both pizzi and arco. His touch is both elegant and powerful, his improvisations melodic and creative (his solo bass album "Ornette On Bass" is also worth checking out). "JLC" starts with solo trumpet, then the band joins with some dissonant interplay, followed by arco bass which move into a folkish melody which could have been written by Henri Texier. "Budmo" is a slow, sad and gloomy piece, which stands in strong contrast to the next one,"5-5", a funky uptempo rhythm fest, with amongst others a stunning duet between trumpet and drums, which then evolves into a variation of Ravel's bolero, with the well-known slightly dancing rhythm. Mikolaj Trzaska, on bass clarinet, is the star of this track. You could say that Trzaska is almost the opposite of Peter Brötzmann : he is a very sensitive sax player with a velvet tone, although he can do some fierce and outside blowing if needed, but it always remains elegant. An I think that word sums up the whole musical style of this album. The last track, "Urodzaj", starts with flutes in a kind of jungle atmosphere, with light trumpet blasts, reminiscent of Don Cherry and Codona, but then Marcin Oles comes on the stage with a wonderfull bass line and he takes the whole band along into a beautiful melody with trumpet and sax alternatingly in unisono and counterpoint, fantastic, but too short, too short, too short... This is free music that is not aggressive, music that is accessisble even if you haven't heard this kind of approach before. Anyone with interest in jazz will appreciate this album. It's rhythmic, melodic, great mastering of the instruments, great interplay. A real treat. Don't miss it! Niezwykłe były okoliczności jej powstania i historie z nią związane oraz fakt, że przeleżała w szufladzie ponad dwa lata. Wszystko zaczęło się, gdy wspólnie z Mikołajem Trzaską szukaliśmy muzyka, który poszerzyłby brzmienie zespołu Oleś|Trzaska|Oleś. Wybór padł na wybitnego francuskiego trębacza. Był to Jean-Luc Cappozzo, którego usłyszeliśmy po raz pierwszy przy okazji jego współpracy z Louisem Sclavisem. Nie sposób było przeoczyç jego krystalicznie czystego brzmienia, nieograniczonych możliwości technicznych czy frazowania pełnego zaskakujących a miejscami wręcz dowcipnych zwrotów. Jean-Luc okazał się wytrawnym i otwartym muzykiem oraz wymagającym partnerem zarówno na scenie jak i poza nią. Już w trakcie pierwszego koncertu, zdaliśmy sobie sprawę, że brzmienie Cappozzo i jego obecnośç w zespole zmieniają charakter naszej muzyki bardziej niż się tego spodziewaliśmy. Postanowiliśmy nagraç wspólnie płytę. Stało się to podczas drugiej wizyty francuskiego artysty w Polsce i było punktem kulminacyjnym zarówno trasy koncertowej jak i istnienia grupy. Zarejestrowany w studio dźwięk okazał się pełen błędow technicznych, co między innymi było powodem odłożenia materiału do szuflady. W tym czasie skupiliśmy się na działalności koncertowej tria Oleś|Trzaska|Oleś, współpracy z Theo Jörgensmannem oraz pracą nad projektami solowymi. Równolegle powstawały nagrania z Davidem Murrayem, Andrzejem Przybielskim, Erikiem Friedlanderem, Kenem Vandermarkiem oraz muzyka teatralna. Suite for trio + nagrana z Jean-Luc Cappozzo nie dawała nam spokoju, gdyż nie tylko nie straciła nic ze swego uroku a wręcz dojrzewała jak dobre wino stając się z czasem bardziej wytrawną i pełną smaków. Pokonując problemy techniczne z pomocą nieocenionego Michała Rosickiego postanowiliśmy doprowadziç do wydania Suite for trio + w obecnej formie i udokumentowaç tym samym ważny etap naszej działalności jakim była współpraca z Jean-Luc Cappozzo. ...piękna i głęboka, pozbawiona taniej wirtuozerii muzyka. ...Bracia Olesiowie już dawno dopracowali sie własnego brzmienia ich muzyka także jest rozpoznawalna, niezaleznie od tego, czy grają solo, z Kenem Vandermarkiem, czy zapraszaja do współpracy Mikolaja Trzaskę. Ich muzyczna erudycje i osłuchanie, a zwłaszcza fascynacje brzmieniem i muzyka współczesną z dużą dozą improwizacji, słychać w każdej kolejnej realizacji. Tak jest i tutaj, gdy do znanego z trzech płyt i licznych koncertow tria Oleś/ Trzaska/ Oleś dołącza francuski trębacz, współpracownik Louisa Sclavisa, Jean-Luc Cappozzo. Niesamowite, jak bardzo jego obecność zmienia muzykę tria, staje się ona bardziej poukładana, skomplikowana i abstrakcyjna jednocześnie. Poukładana, bo każdy muzyk do tej koncepcji pasuje i spełnia w niej istotną rolę, skomplikowana, bo brak tu tematow powracajacych okresowo. Rytmika jest bardzo połamana abstrakcyjna, nieocierajaca się już o galicyjskie klimaty (jak na Mikro Muzik, staje się swobodną podróża. Trzeba tylko pozwolić dać sie tej muzyce unieść. ...Pomimo, że tylko kompozycja tytułowa okreslona jest mianem suity - cała płyta robi wrażenie zamkniętej, doskonale zaplanowanej całości. Od tajemniczego, mrocznego wstępu granego na klarnecie basowym przez Mikołaja Trzaskę, po impresyjny, przestrzenny "Urodzaj" muzyka układa się w fascynujacą opowieść o spotkaniu różnych swiatów dzwiękowych. W moim przekonaniu spotyka się tu wyobraźnia sonorystyczna Cappozza z inwencją melodyczną naszych muzyków, jest to także starcie długiej, suitowej formy z błyskawicznie realizowanymi, wyładowującymi się na małej przestrzeni pomysłami gościa znad Sekwany. Obdarzony ognistym temperamentem trębacz potrafił wzbogacić czasem nieco statyczny krajobraz dzwiękowy Tria. Nic jednak na tym nie straciła atrakcyjność melodyczna kompozycji. "Suite..." to przykład idealnej równowagi i uzupełniania się przeciwstawnych elementów.